This should refute the recent post on Natural Height Growth. Comparison study of growth plate fusion using MRI versus plain radiographs as used in age determination for exclusion of overaged football players. "150 healthy male football players were grouped into five age groups ranging from 15 to 19 years old. Each participant had coronal T1-weighted MRI and plain radiograph of the left wrist. The degree of distal radius fusion was rated randomly by three radiologists using a six-stage grading system proposed by the FIFA Research Centre. MRI assessment of distal radial growth plate fusion has good correlation with plain radiograph fusion (r=0.949). The mean of x-ray grading is higher than the MRI grading in the 15, 16, 17, 18 and 19 years old age groups with p=0.443, 0.001, 0.009, <0.001 and 0.003, respectively, using Wilcoxon signed ranked test. Intraobserver and interobserver correlations were high (r=0.9). 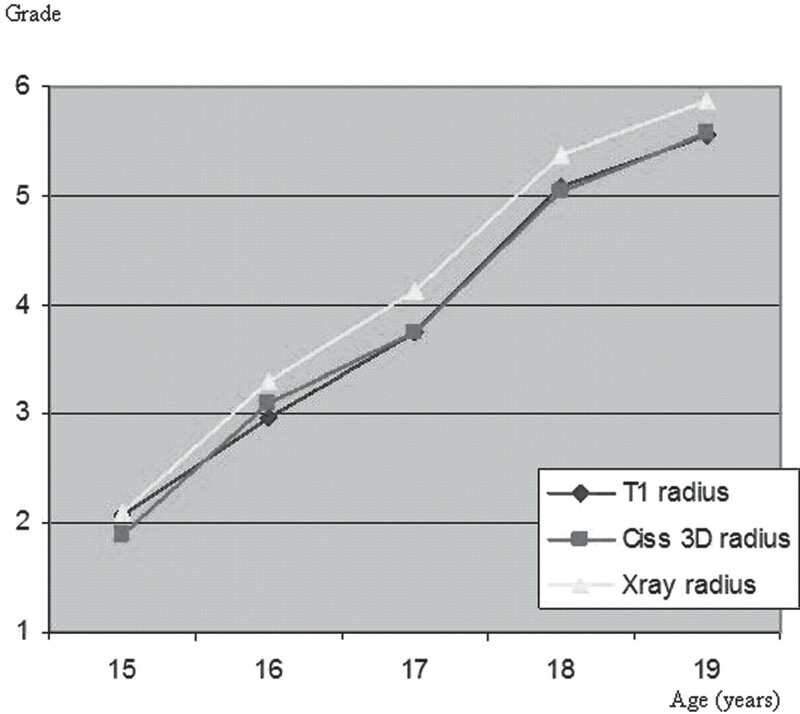 T1 MRI correlation with chronological age (r=0.771) was close to plain radiographs (r=0.821) with p value of <0.001. 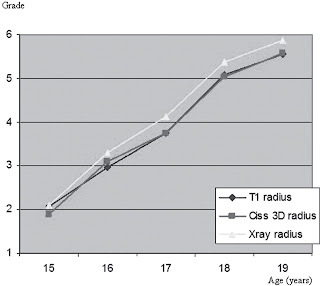 X-rays significantly overrate the grading of fusion in this age group and therefore should not be used to exclude overaged players as is occurring now to the distress of many genuinely eligible players." "Grade 2. (A)[X-ray:] There is disruption of the lucent band noted in the distal radial epiphysis suggesting early fusion. (B)[MRI:] This correlates to the intermediate high signal area causing ‘fuzziness’ of the low signal band of the growth plate." "Grade 3 growth plate. (A,B) Less than 50% fusion on plain radiographs of the radial epiphysis both on x-ray and T1-weighted MRI. Arrows point to areas of fusion. "<-A would appear to be totally fused except for one tiny opening on the fibula. "Grade 4 growth plate. (A) There is more than 50% fusion of the growth plate on the plain radiograph. (B) Similar correlating appearance on T1 MRI weighted MRI of the same patient. Arrow shows absence of epiphysial plate fusion of more than 5 mm in length." Grade 4A actually looks more fused than Grade 3A. "Grade 5 growth plate. (A) There is less than 5 mm fusion left of the fusion of the growth plate in plain radiograph. (B) Similar correlating appearance on T1-weighted MRI of the same patient (arrows). "<-And 5A looks even less fused. 5B however does look more fused than 4B. "Grade 6 growth plate. (A,B) Complete fusion of the growth plate seen on both x-ray and T1-weighted MRI. "<-in 6B you can still see a line in the tibia and faintly in the fibula. "[The MRI] has superior soft tissue contrast and cross sectional imaging ability that would allow the epiphysial growth plate and epiphysial–metaphyseal fusion to be beautifully demonstrated." 6 There is complete fusion of the growth plate. There is no evidence of any notch (figure 6)"
Note that there is evidence of partial fusion starting at Grade 2 which is when boys arms are still getting longer. Thus you can increase bone length without complete opening of the growth plate. Thus you can grow taller with LSJL partial growth plates theory. On your opinion, what does prevent LSJL to work for the moment? What has to be improved? One thing we can tell, after reading these statements, is that now it is impossible to control the methylation status of DNA and telomere length in stem cells inside the body. It can be done in a research of DNA methylation and telomere length in Petri dish in laboratory as a fundamental scientific work. And it is even hard to imagine to use subchondral plates to lengthen bones. Nevertheless it is difficult to make any statements, after reading only unconnected parts of the text. We take part in different worldwide conferences and always look through a scientific publications on this topic. And we haven't seen any allusions to non distracting bone lengthening methods. Initially our method was developed to reconstruct vast bone defects due to trauma, fractures and other types of bone tissue loss. And bone lengthening is just one of the types of bone tissue loss, that's why our method can be applied to this problem too. Who'd you talk to? Did you mention Yokota/Zhang's LSJL research? inject stem cells+ kartogenin get chondrocytes, but controlling DNA methylation how? do you think a stem cell specialist can help us? one that works with MSC's.